Xenoestrogens – Xenos is “Foreigner” in Greek – are a family of molecules that are synthetic forms of estrogen. They are known as endocrine-disrupting chemicals, as they have the ability to bind to estrogen receptors and induce signaling pathways by mimicking the hormone. Numerous household and personal care products have been found to contain xenoestrogens. Parabens are an example of xenoestrogens found in shampoos, body lotions, soaps etc. The industry uses parabens for they anti-fungal properties, making them effective preservatives for household products. For a few years now, studies analyzing the effects of parabens on our system have multiplied. Although, for some, the toxicity of parabens is still unclear, their use is regulated. 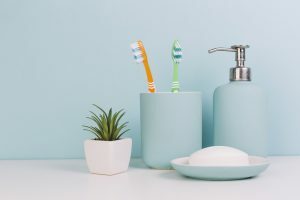 For example, the European Commission stipulates that, for a product put on shelves after April 16th, 2015, the maximum concentration of “Propylparaben and Butylparaben, […] is 0.14%, when used individually or together”. To efficiently and rapidly analyze the levels of methyl-, ethyl-, propyl- and butyl-paraben in cosmetic products, we have developed a method using LDTD/MS-MS. In our Application Note #1504, we analyzed three samples of body/hand lotion. Of those three samples, two did not mention the presence of parabens in the ingredients list (Sample #1 and Sample #3). We were able to determine that, indeed, Sample #3 had very low concentrations of parabens and Sample #1 showed concentrations of methyl- and ethyl-paraben of (on average) 0.1865 g/kg.